This week we’re very excited to welcome Scott Snyder, writer of American Vampire and Severed, and who just wrapped up his run on one of our favorite books of the last year, Detective Comics! Scott talks to us about his upcoming work on post-DC-reboot Batman, how he get his start in comics, a nerve-wracking meeting at C2E2, how he got Jock and Francesco Francavilla to work on Detective, the Bat-Family’s favorite Elvis songs, and more! Plus, we welcome another member of the Ajax Hundo Club, Susan Cole, and answer a question from our listener mailbag! Follow Scott on Twitter, and as he said on the show, he’s on Facebook, too! Scott’s collection of short stories, Voodoo Heart, is available on Amazon. Francesco Francavilla’s audition comic strip for Detective will be in the hardcover of Scott’s run on the book, but you can see an online version here. Check out Grant Morrison’s Rolling Stone interview. Now read it in a “Nature Boy” or “Hollywood” voice. While you’re at it, read Chris’ CA review of Batman Incorporated #8. Here’s the recipe for 10-minute Lime Cracker pie. If you haven’t listened to Marc Maron’s WTF podcast, it’s a great example of enlightening interviews between people who don’t see eye-to-eye. This week, we welcome back the Alec Baldwin to our SNL, outgoing Superman writer Chris Roberson, for his fifth appearance on War Rocket Ajax! 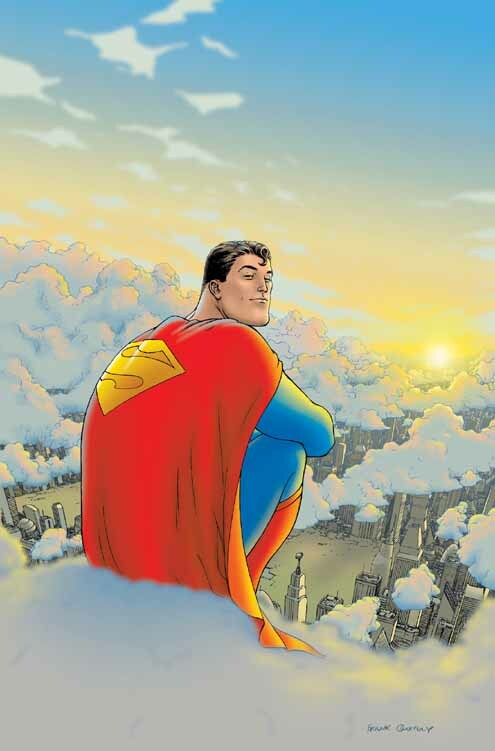 Chris sits down with us for an in-depth discussion of his Superman #714, the last appearance of pre-reboot Supes, why the issue with Sharif never hit the stands, how his run ties in to All-Star Superman and DC One Million, Superman’s favorite movie, what Stan Lee’s really like, his upcoming Star Trek/Legion of Superheroes crossover, and much more! Plus, we welcome another member of the Hundo Club, Derek Lancaster, who may just be attempting to become one Mr. Chris Sims. Chris Roberson is on Twitter here and be sure to check out his website. Watch this Sprint ad closely to catch a glimpse of Starborn, the comic Chris writes for Stan Lee’s imprint at BOOM! Studios. It pops up around the 0:23 mark. Here’s a good look at the original S-shield design Morrison and Quitely were going to use in All-Star Superman. We’ve mentioned it before, but the Grant Morrison documentary, Talking With Gods, is on Hulu. Some industrious soul has posted Chris R.’s favorite episode of the ’90s Superman animated series on YouTube. Chris S. and Matt’s favorite isn’t all up there, but here’s the big scene. Jedward? Proms? The Queen? These are the things about the UK we just don’t get. This week we’re proud to welcome the writer and artist of Tales Designed to Thrizzle and the upcoming Autobiography of Mark Twain 1910-2010, Michael Kupperman! We talk with him about his long-standing obsession with the author and his lookalike, Einstein, as well as performing his comics live, the Snake ‘n’ Bacon pilot for Adult Swim, the creative process, doing photo-comics and a ton more! Plus we take a ton of questions from Twitter to determine the winner of our book giveaway! Follow Michael on Twitter and check out his website! Here’s Matt’s favorite page from the short-lived Cracked Magazine relaunch: Michael’s Spy-Scope ad parody. The Internet Archive has a ton of old radio shows to listen to. And Michael’s right. They’re hilarious. If you didn’t see the Snake ‘n’ Bacon pilot on Adult Swim a few years ago, it’s on YouTube! Take a look at the Wikipedia articles for Archie’s various superhero characters from the ’60s. They’re nuts. Chris took Friday off, so Laura Hudson did an Ask Laura column. She got a lot of Batman questions. Matt Digges’ Amalgam Reborn Tumblr is pretty amazing. Tonight, Chris and I are interviewing Michael Kupperman of Snake ‘n’ Bacon and Tales Designed to Thrizzle! His new book, Mark Twain’s Autobiography 1910-2010, comes out in November, but one lucky WRA listener can get a copy now, just by asking a question on Twitter during our interview. Simply tweet your question at @theisb with the hashtag #KuppermanAjax for a chance to win! In celebration of his brand new Punisher #1, Greg Rucka — writer of Detective Comics, Whiteout, Queen and Country, Stumptown, Gotham Central, Wolverine and a ton more — stopped by to talk to us about it his new webcomic and, of course, Batman. We get deep into the nature of those characters and heroism. Plus, why Wonder Woman’s DC’s best character and Superman’s so difficult to write. Plus, Chris and Matt answer a listener question about their old Carolina hometowns! Greg’s on Twitter, so give him a follow! And check out his website, too! For those unfamiliar with Portland’s Major League Soccer team, the Timbers, here’s their website. See Chris’ lifelong dreams come true with Kevin Conroy and Adam West. Earl Scruggs (who Matt was totally wrong about writing “Dueling Banjos”) vs. Masta Killa: The battle of the hometowns. It’s the first Monday of the month, which means it’s time for another War Rocket Ajax/Comics Alliance roundtable! This month, we welcome Comics Alliance’s own David Brothers and Andy Khouri to the show to talk about the madness that was San Diego Comic-Con International! Among the topics we cover are the huge reaction to DC’s response to a fan dressed as Batgirl, how tough it is to get into panels, everyone’s best and worst moments, post-Comic-Con doldrums, the lack of a big movie presence this year, and a ton more! Check out Andy and David on Twitter! Also, be sure to read David’s site, 4thletter! Here’s Laura Hudson’s initial response to DC’s answer to the female creators question, and DC’s Sunday “we hear you” message. Give Andy’s 2009 article about the trouble with panel attendance at SDCC a read. The problem’s still there. Michael Kupperman’s new Mark Twain book is going to be awesome. Watch Chris Sims experience In-N-Out Burger for the first time. The Grant Morrison documentary, Talking With Gods, is on Hulu. Judge for yourself.